This hardboiled monotreme came together suprisingly well for a last minute dealie. He's kind of got a Sammo Hung thing going on. 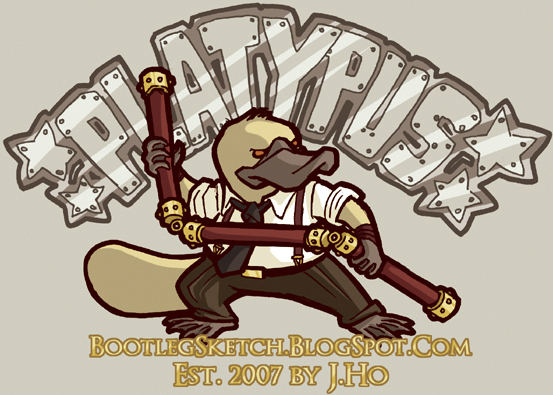 First, I see him yelling random things like "PLATY-ATTACK!" as he attacks his enemies, which of course are invisible ninja agents from another dimension that only he can see, otherwise his world is quite normal in that Hammett/Chandler dark noir way. Secondly I think his series should be called Monotreme Law, a play on Sammo Hung's TV series Martial Law.